All you ever wanted to know about climbing Scotland�s mountains in winter but had no-one to ask! 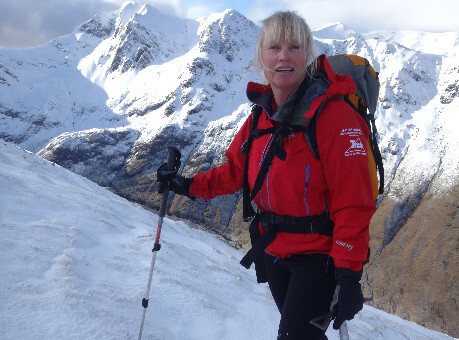 This month Mountaineering Scotland is hosting a live Facebook Q&A session when an expert panel led by our Mountain Safety Adviser Heather Morning will answer questions on mountaineering in winter. 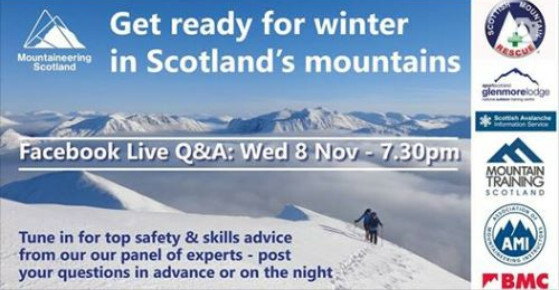 The panel will answer questions sent in both in advance and while they�re live �on air�, and offering essential advice to help people get the most out of Scotland's mountains this winter, whether they�re venturing out into the hills under snow for the first time or could just do with a refresher or a particular piece of advice. The panel will be drawn from mountain rescue team members and experts from Glenmore Lodge, Mountain Training Scotland, the Scottish Avalanche Information Service and the Association of Mountaineering Instructors. Set aside about an hour or so from 7.30pm on Wednesday 8th November and look in on the live session. If you have a question you�d like the panel to answer you can send it in while the Q&A is happening or, to make sure it gets seen in time, post it to the event page in advance. Check out the event here and let us know that you�re interested in tuning in.